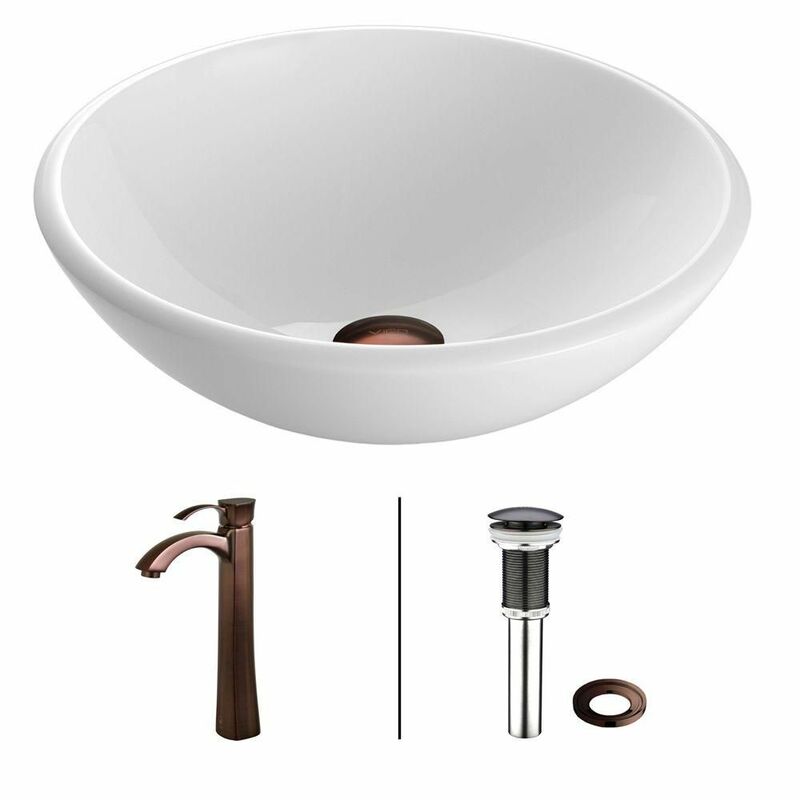 Stone Vessel Sink in White Phoenix with Otis Faucet in Oil-Rubbed Bronze is rated 4.9 out of 5 by 26. Rated 5 out of 5 by Tim210 from Beautiful finish We bought two of these for our master bath, they were well made and had a beautiful finish on them. Easy to install. Rated 5 out of 5 by T and L from Simple and beautiful! We bought this Vigo Elizabeth Stone Vessel Sink in February for a remodel of our small main bathroom. We saw this sink at a friend’s home paired with a bronze faucet but we used chrome and it’s equally as gorgeous. My husband built our vanity and it has a walnut top. This white sink looks stunning with it, but I think it would be great with just about any material. The sink is well made and was praised by our contractors. Rated 5 out of 5 by SusieQ from Perfect! This vessel sink was packaged well and beautiful. It worked perfectly for the vintage console turned vanity!! Rated 5 out of 5 by Kcbuzzwoman from Nice size bowl for my 36 x 22 vanity. ... Nice size bowl for my 36 x 22 vanity. I bought the Vigo waterfall faucet to go with it and there is no splashing. I am very happy with my purchase. Rated 5 out of 5 by HBolen from Perfect! I bought this for a bathroon redo and to go with my antique vanity. It looks great and was easy to install. Rated 5 out of 5 by DIY 1969 from Quality I bought this a week ago. I am installing on a custom made vanity. Very good choice. Was not able to see it in the store, but better than what we seen on display at Menards. Rated 5 out of 5 by Dawn from beautiful study bowl I bought this sink as a replacement for another vessel bowl from another company that I was dissatisfied with--this is much sturdier and I feel more comfortable. Rated 5 out of 5 by Nenamala from White Beauty I bought 2 for our Master Bath and I love them. The quality is very nice and the fit is perfect!